Guillermo del Toro is a master of surreal, atmospheric horror - as evidenced by Pan's Labyrinth, which even now I can't seem to find any other movie with which to compare. As soon as I heard that he was making a Victorian Gothic ghost story - with Tom Hiddleston, no less - I could barely contain my excitement and frenzied curiosity. 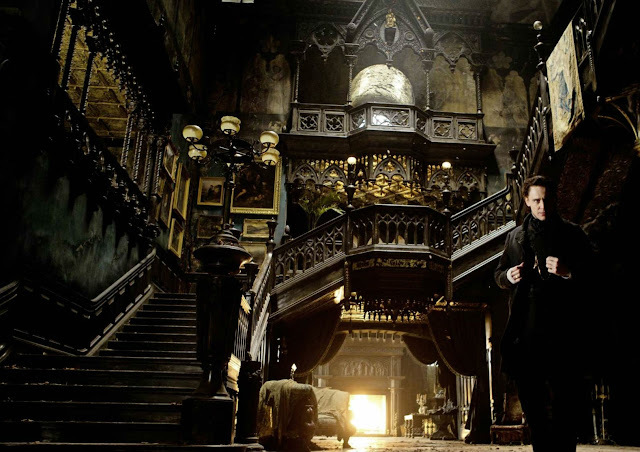 Crimson Peak is a magnificent visual and atmospheric feat. You must see it in the big screen to fully enjoy the experience. This is the type of movie that I willingly pay almost $13 for. Every scene is arresting - I didn't want to blink and miss anything, except when it was too gory (yes, this has some blood and gore. Things were done to faces that I have not seen before) and I had to avert my eyes. Mia Wasikowska plays a Edith, a beautiful young heiress and budding writer of ghost stories. When her father dies, she agrees to marry a mysterious English lord, Thomas Sharpe, played by the always delicious Tom Hiddleston (!). 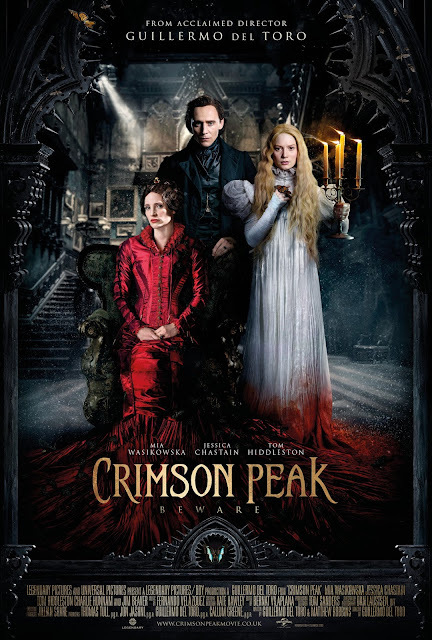 Together with his strange and hostile sister, Lucille (Jessica Chastain) they live in a decaying English mansion called Crimson Peak, which of course is haunted by horrifying ghosts. 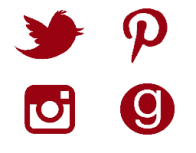 There are shades of Rebecca and Bluebeard and some telling literary references. For instance, when Edith is mocked by other debutantes for wanting to be Jane Austen "who died a virgin," Edith retorts, "I'd rather be Mary Shelley and die a widow." 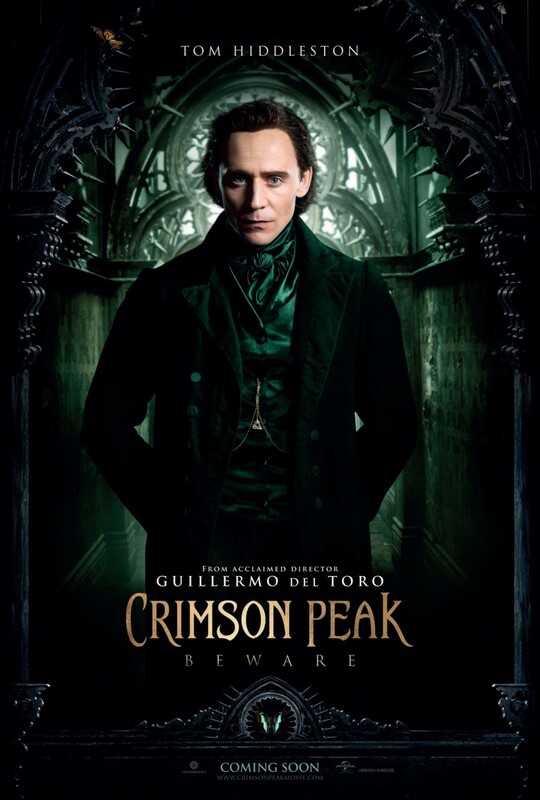 Tom Hiddleston is pitch perfect as a pale, Byronic English lord but Jessica Chastain easily stole the entire movie. 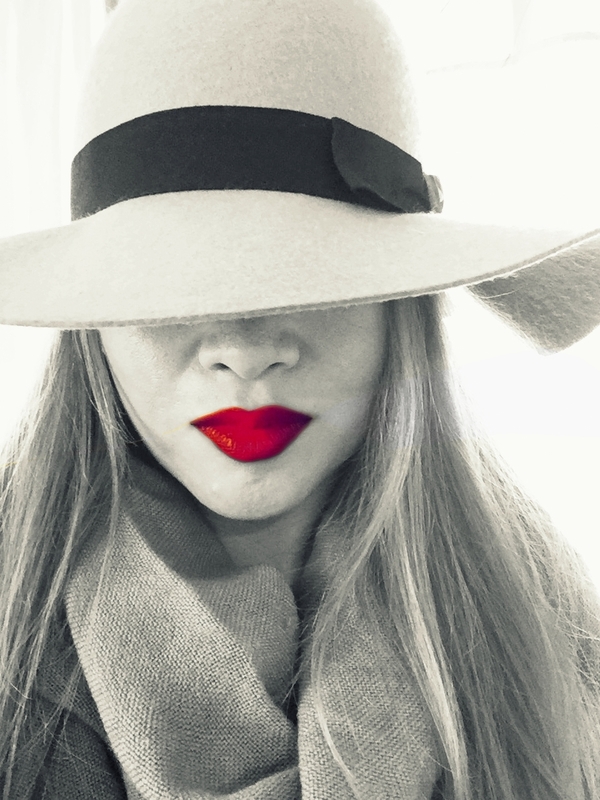 With her sharp cheekbones and dramatic beauty, plus over-the-top performance as the menacing Lucille, I could not keep my eyes of off Jessica. It also helped that she had the most lavish costumes. This dark blue-green velvet number was one she wore most in the interior mansion scenes. 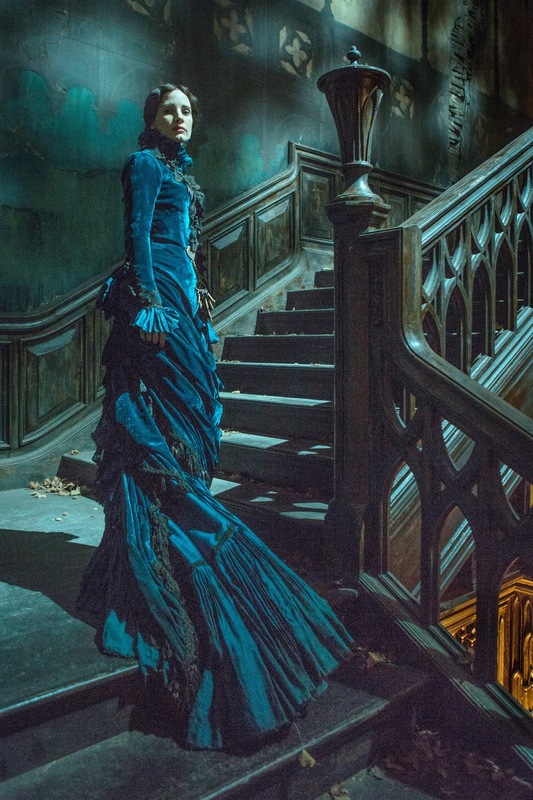 It is heavy, tightly structured, and sensual all at once, almost blending into the dark shadows of Crimson Peak's decaying ruins. This burgundy gown is our first glimpse of Lucille in the movie - she looks regal - almost Queen Elizabeth-like, but it gives off an unmistakeable aura of danger. This black velvet number was only used in one scene but it's my favorite - so striking against Jessica's pale skin, with that unexpected bright, red flower pinned to the bodice. Mia Wasikowska was in one ethereal and diaphanous white nightgown after another for most of the movie, underscoring her innocence and youth as a light amidst the moldy and ghost-infested mansion. Early on there is a scene between Edith and Lucille discussing butterflies and over and over butterflies appear as a leif motif in various ways throughout the movie. Edith is the rare and beautiful butterfly in her leg-of-mutton sleeved nightgowns, as light and airy as wings, flitting about amidst the horrors of her husband's home. 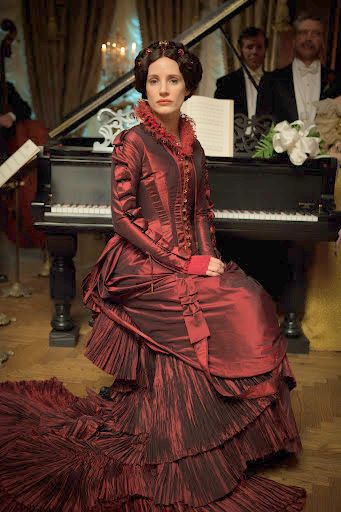 My favorite costume of Edith's is in the party scene, where she wears a cream silk gown with ropes of pearls. The only character more over-the-top and visually stunning than Lucille is the mansion itself. I could practically smell the mildew and feel the draft of cold air. Apparently, Del Toro had a real mansion built for the movie, which has unfortunately been already torn down. 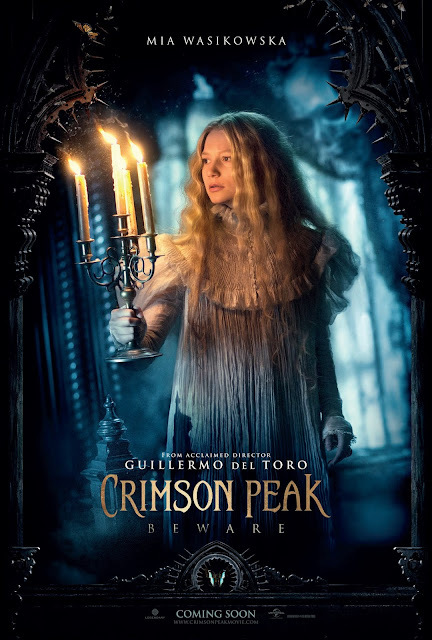 If Crimson Peak does not get nominated for costume design or set design at the Oscars next year, it will be a horror indeed. I'm as surprised as anyone that cauliflower would get its own headline. If you want to talk about unassuming and overlooked - cauliflower would come to mind. And yet, over the past year, I've come to find the most inventive, unexpected and -most importantly - delicious uses for this humble vegetable. Everything from cauliflower pizza crusts to an addictive vegan alfredo sauce. I must confess that I have a serious carb problem. Bread, pasta - and yes - rice. I never met a carb I didn't like. While I would never seriously contemplate breaking off this love affair, from time to time, I do entertain viable alternatives. Cauliflower is so versatile, I started thinking about making rice out of it. I wasn't quite shocked to see that I wasn't the first one to think of the idea. Cauliflower, it seems, can do anything. There are a multitude of cooking methods out there: stovetop, microwaving, sautéing, and roasting. Now, cauliflower will never taste like rice. But out of all these methods, I found roasting to be the simplest and quickest method, with results that came closest to rice in terms of texture. It comes out fluffy, light and filling. 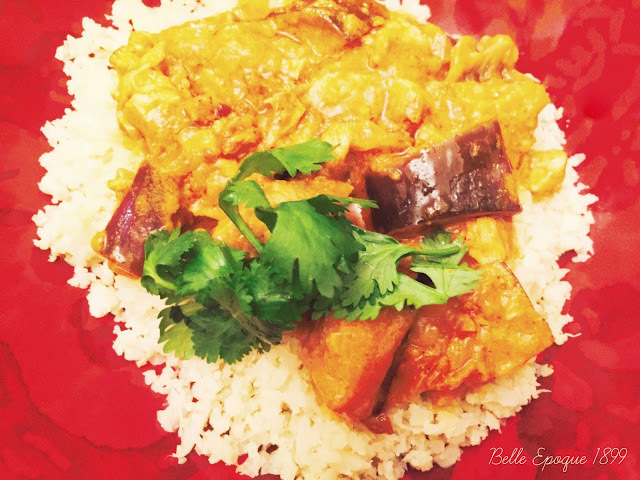 When paired with my favorite curries or stir fry dishes, I can honestly say I don't miss rice at all. Because I usually eat rice with a very flavorful main dish, I prefer to cook the cauliflower plain - not even with salt. However, if you want a bolder side dish, sprinkle some salt and pepper, add some minced onions and garlic, or minced herbs like mint or cilantro. 2. Chop off the leaves from the head of cauliflower and break off into small florets. 3. Place florets in a food processor and pulse until the florets have been broken up into rice or couscous-like texture. 4. Pour some olive oil onto a baking sheet and with a paper towel, make sure the entire surface is oiled. 5. Place the cauliflower rice onto the baking sheet for the thinnest layer possible. 6. Place the baking sheet on the middle rack and bake for 10-15 minutes. You want to draw out as much moisture from the cauliflower as possible. 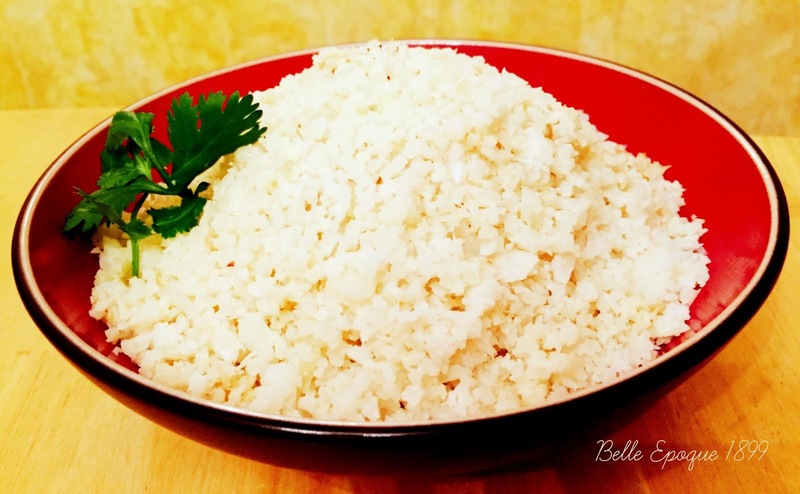 The result should be light, fluffy and steamy "rice kernels." In a shadowy antiques shop in Rome, violinist Julia Ansdell happens upon a curious piece of music—the Incendio waltz—and is immediately entranced by its unusual composition. Full of passion, torment, and chilling beauty, and seemingly unknown to the world, the waltz, its mournful minor key, its feverish arpeggios, appear to dance with a strange life of their own. Julia is determined to master the complex work and make its melody heard. Back home in Boston, from the moment Julia’s bow moves across the strings, drawing the waltz’s fiery notes into the air, something strange is stirred—and Julia’s world comes under threat. The music has a terrifying and inexplicable effect on her young daughter, who seems violently transformed. Convinced that the hypnotic strains of Incendio are weaving a malevolent spell, Julia sets out to discover the man and the meaning behind the score. Her quest beckons Julia to the ancient city of Venice, where she uncovers a dark, decades-old secret involving a dangerously powerful family that will stop at nothing to keep Julia from bringing the truth to light. Playing with Fire starts in a way that immediately portends that I’m in for an amazing story. Old books, a mysterious antique shop – already I’m intrigued. But if you think that the first chapter is all about slowly setting the scene, you’d be wrong. Gerritsen loses no time in seizing your attention and doesn’t relinquish it until the last page. Something horrifying happens soon after Julia brings home the sheet music purchased from the shop. With each shocking event that occurs, Julia begins to think that the Incendio waltz is somehow responsible. People around her begin to doubt her sanity. Is she mentally ill or does the waltz have a supernatural and evil power that only she believes in? Just when you think you know where the book is going, it twists and turns in surprising ways. Alternating with Julia’s narrative is the background of the Incendio waltz, which has to do with forbidden love, despair, and unspeakable tragedy in World War II-era Italy. As compelling as Julia’s narrative is, the harrowing story of the past moved me immeasurably. I am always grateful to novels that have historical basis in fact, which leads me to learn something important I didn’t know about before. Like the Incendio waltz itself, Playing with Fire increases in suspense and pathos with each turn of the page. Warning: you might forget to eat dinner, like I did, so absorbed was I in finishing this book. New York Times bestselling author Tess Gerritsen earned international acclaim for her first novel of suspense, Harvest. She introduced Detective Jane Rizzoli in The Surgeon (2001) and Dr. Maura Isles in The Apprentice (2002) and has gone on to write numerous other titles in the celebrated Rizzoli & Isles series, most recently The Mephisto Club, The Keepsake, Ice Cold, The Silent Girl, Last to Die, and Die Again. 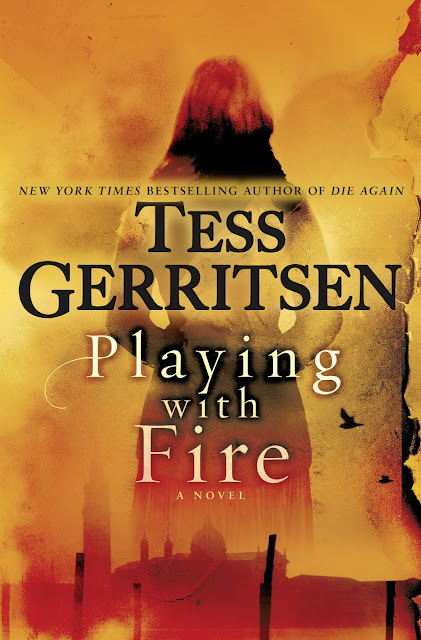 Her latest novel is the standalone thriller Playing with Fire. A physician, Tess Gerritsen lives in Maine. The book is about, among other things: the strongest boy in the world, a talking cockatoo, a faulty mind reader, a beautiful bearded lady and a nervous magician, an old museum, and a shrunken head. Blessed with extraordinary abilities, orphans Philippa, Sam, and Thomas have grown up happily in Dumfrey’s Dime Museum of Freaks, Oddities, and Wonders. But when a fourth child, Max, a knife-thrower, joins the group, it sets off an unforgettable chain of events. When the museum’s Amazonian shrunken head is stolen, the four are determined to get it back. But their search leads them to a series of murders and an explosive secret about their pasts. This sensational new series combines the unparalleled storytelling gifts of Lauren Oliver with the rich knowledge of the notorious relics collector H. C. Chester. 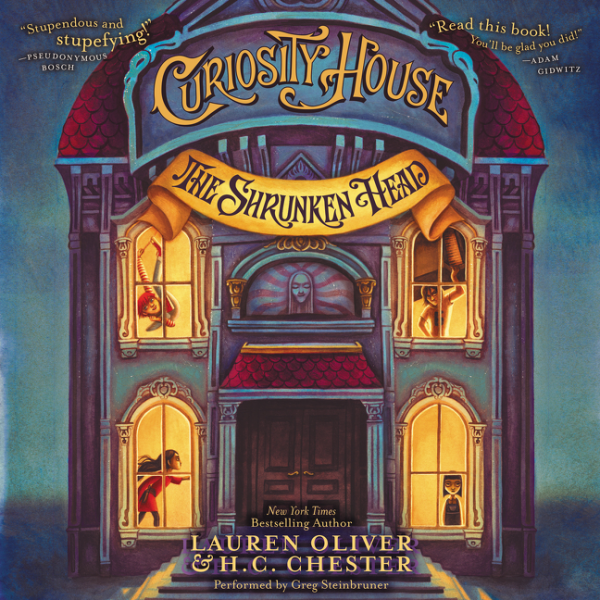 The Shrunken Head is one of the most appealing middle grade books I’ve read in a long time. The quirky description’s hint of Lemony Snicket, combined with the lack of brussels sprouts, instantly tickled my fancy. I loved all of Oliver’s other middle grade books, Liesl and Po and The Spindlers, so I knew I would be in wonderful hands. Oliver and H.C. Chester make a great writing duo. While The Shrunken Head isn’t a fantasy like Oliver’s other middle grade books, it is a fast-paced mystery adventure that kids will love. Sam, Pippa, Thomas and Max are all considered “freaks” by the outside world, but in Dumfrey’s Dime Museum, they’re celebrated for their one-of-a-kind talents. Shy Sam may look like a scrawny beanpole but he’s the strongest kid in the world. Brainy Thomas can bend, stretch and flatten his body into any shape. Serious Pippa is a mentalist. And Max (short for MacKenzie) –tough, streetwise Max – is a wizard at knife-throwing and pickpocketing. I love the chemistry between these four, strange kids but I have a soft, knife-shaped spot in my heart for surly Max. I also was drawn to the atmosphere of the Dime Museum, where the kids and other carnivalesque folk reside (the elephant man, the bearded lady, a magician, an alligator boy, etc.). Together, they form a loyal family, with Mr. Dumfrey as its flamboyant but kindly father figure. When Dumfrey’s prized exhibit, a shrunken head, is stolen and murders and violent attacks start occurring, the four children of Dumfrey’s Dime Museum decide to band together to solve the mysteries. The twist-laden plot has its red herrings and revelations, not the least of which is how Sam, Pippa, Thomas and Max are connected. I’m extremely curious to find out more about their origins and further adventures in the next books of this series.